The elaboration of instruments such as a management plan is necessary for achieving the effective implementation of a conservation area. The “Ecological Development Project for the Itatiaia Forest”, created in 1988, was the first initiative of this type, but unfortunately, it did not obtain the necessary resources to implement it. 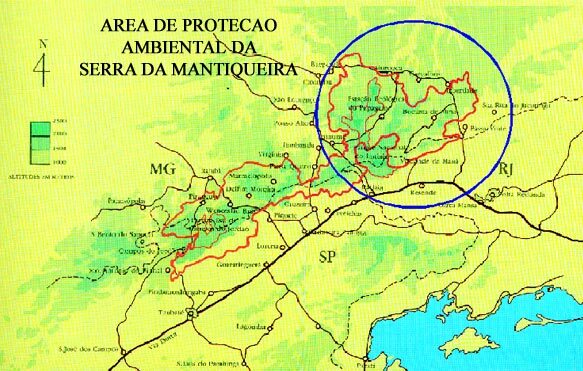 Later, in 1991, the Defense Front of Mantiqueira (FEDAPAM) published the Mantiqueira Report, in which the necessity for designing and implementing the APA zone was highlighted. However, 15 years after the implantation of the APA, neither a management plan nor the corresponding zoning layout has been done. Looking to reverse the process of degradation in the Mantiqueira APA, the NGOs Crescente Fértil, Fundação Matutu, Instituto Ideas, Partnershaft Mirantao, Instituto Brasil de Educação Ambiental, Centros Comunitários de Colina e Campo Redondo, SOS Mata Atlântica, and Fundação Luterana de Diaconia, among others, have been working together since 1999 to implement a series of projects on ecological development. these projects, articulated among each other, form the Mantiqueira Program. The APA is located between the three largest cities in Brazil – Rio de Janeiro, Sao Paulo and Belo Horizonte – encompassing an area that equals close to 400,000 hectares. This area contains original forested areas that are interconnected. It is also one of the conservation areas that make up the southern corridor of the Mata Atlântica, where several contiguous areas of original forest of this biome are concentrated. The Itatiaia National Park (PNI)), located in the southern part of the APA and established in 1937, was the first national park created in Brazil. Encompassing an area of nearly 30,000 hectares, the Park represents an important matrix of rare and endemic species. In Rio de Janeiro, the municipalities that make up the APA represent high indices of urbanization and a diversified economy with a significant presence of industries. The southern region of Minas is characterized by a predominantly rural condition, with a poorly diversified economy and a relatively low standard of income. Several different cultures coexist in the APA, such as: descendants of Puri and Botocudo Indians, European immigrants (especially Germans), traditional Catholics from Minas Gerais, urban citizens searching for an alternative to the conventional consumerist way of life, spiritual groups and tourism entrepreneurs. Its natural and cultural heritage is notable, even despite of the process of degradation that is taking place, exhibiting peculiarities that are becoming more and more rare in the regional context of southeastern Brazil.